Kingsbury, Inc. has been awarded an order from the compressor manufacturer to supply thrust and journal bearings for a total of ten machines. 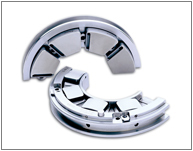 The supply consists of tilting pad journal bearings and leading-edge-groove (LEG®) SlimLine thrust bearings (shown). As part of the project, an additional order was awarded from the gearbox manufacturer to supply bearings for 12 machines, including tilting pad journal bearings with and without adjustable shims, ranging in diameter from 70 to 140 mm, as well as 5" to 7" LEG® thrust bearings. Kingsbury's LEG® bearing is a patented directed-lubrication product that delivers significantly more load capacity with less oil flow and at lower temperatures than either conventional flooded or competitive directed-lubrication bearings. 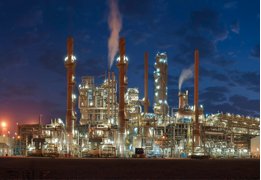 The Shah gas development is the first in the United Arab Emirates, the world's third-largest oil exporter, for a sour gas field to include the construction of the product pipeline and for the processing and storing of sulfur at the Ruwais terminal. The project, to be implemented in three phases, will process about 1 billion cubic feet [30 million m3] per day of sour gas from 20 wells, and includes building facilities to gather and process the gas and sulfur.